The Hornet Convertible Brougham, to use its full title, was the most expensive model in the Hornet range at just under $3,300. With production figures of just over 24,000 for the whole Hornet range, the convertible was a rare sight even when new. With the wire wheel option and full leather trim the Hornet convertible was a fitting model for the final Stepdown cars that would be replaced for 1955 by a Nash-sourced range. 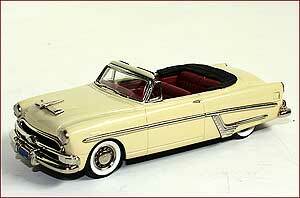 Brooklin Models 1954 Hudson Hornet Sedan. This was the last of the traditional 'step-down' Hudsons and the 4 door semi-fastback sedan was the last Hudson to keep the styling introduced in 1948. 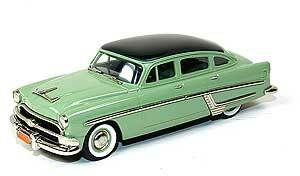 In deep financial trouble, Hudson would be absorbed into the Nash empire to form American Motors and the following year's Hudson used a Nash body.